Power failure at the operation time:run after the power supply. Humidity control setting:Press Set keyboard one time,press three second enter into setting menu after humidity display flashing,it will display code HC.Press "▲ "keyboard or "▼"keyboard can cyclical selection HC-CP-PU-CA-HP parameter code.Please press Set keyboard if you need enter into a code,press "▲ "keyboard or "▼"keyboard to modify the required numerical for five seconds then return automatically. parameter code,please press "SET " keyboard if you need enter into one code ,press "▲ "keyboard or "▼"keyboard to modify the required numerical for five seconds then return automatically. Dehumidification control: The way of mode control (code HC) it will be dehumidification control when setting as C.For example,set the humidity control value as 50% RH and humidity difference as 5%,relay start output,When environment humidity value ≤setting humidity value(50%RH),relay close output. 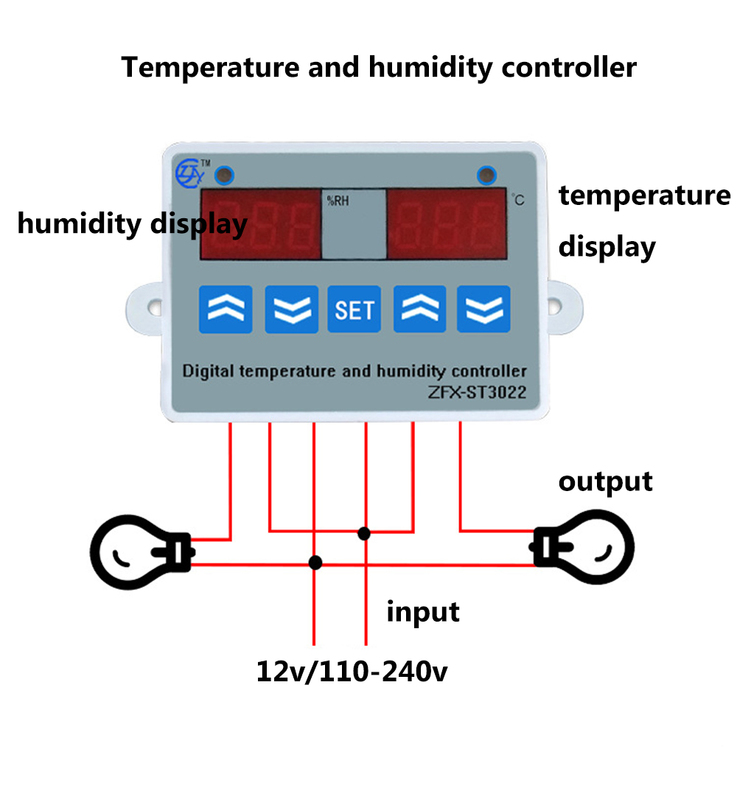 Damping control:The way of humidity control (code HC) ,set H as damping mode,for example,set the humidity control value as 50%RH and humidity difference as 5%RH. When temperature humidity value ≤setting value(50%RH)-difference/(5%RH) ,relay start output.when temperature humidity ≥setting value(50%RH),relay stop output. HC:mode selection,H means humidifying mode,C means dehumidificatio mode. D:return difference, start the humidify when in the humidifying mode=displaying humidity-return difference.start the humidify when in dehumidification mode=displaying humidity + return difference. PU:Delay to start.when relay stop output and start timing.the interval time of next boot must greater than delay start time to avoid start frequently. HP:Humidity upper limit alarm:when humidity exceed upper limit alarm,digital tube displaying "-H-",humidity lower than alarm setting value it will return back from alarm automatically. LS;Humidity lower limit alarm:When humidity exceed lower limit,digital tube display"-L-",humidity higher than alarm setting value it will return back from alarm automatically. CA:Humidity correction:Humidity correction value plus displaying value.For example:humidity display 50% RH correction humidity increase 5% RH,then display humidity will be 55%RH. Heating mode:Mode control way (code HC) set as H ,it is heating mode.For example,set control heating value as 35℃,temperature return difference is 2°.when environment humidity value ≥setting temperature value(35℃)-return difference(2 ℃),relay start output.when humidity value≤setting humidity value (35℃),relay close output. 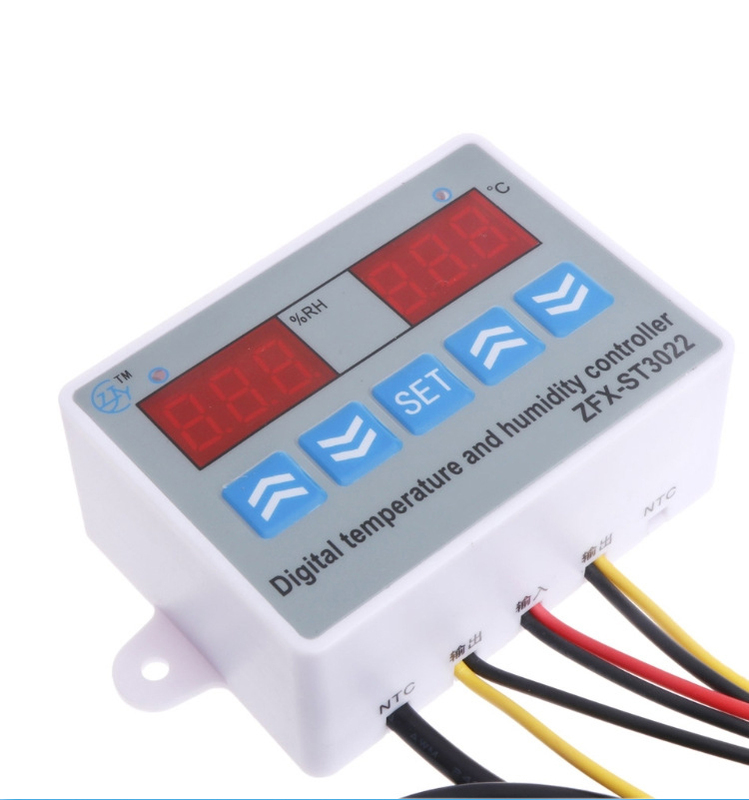 Cooling control:The way of mode control ,set (HC code) as C ,it is cooling mode.For example,set cooling as 35 ℃ and temperature return difference as 2 ℃.When environment value ≥ setting temperature value (35℃)+return difference(2℃),relay start output:when environment humidity value≤setting humidity value(35 ℃),relay stop output. HC:Mode selection,C means cooling mode,H means heating mode. D:return difference,start temperature when in heating mode= displaying temperature"-return difference.Start temperature when in cooling mode=displaying temperature+return difference. PU:Delay to start,When relay stop output and start timing,the interval of time must greater than delay start time to avoid start frequently.HP:temperature upper limit alarm:when temperature exceed upper limit alarm,digital tube display"HHH",temperature lower than alarm setting it will return back from alarm automatically. LS:temperature lower limit alarm:when temperature exceed than lower limit alarm,digital tube display "LLL",temperature higher than alarm setting it will return back from alarm automatically. CA temperature correction:Humidity correction value plus display humidity value,for example:humidity displaying 35℃ ,correction humidity increase 5℃,then temperature should be 35℃. Reset:Press left up and down keyboard until screen displaying 888,then it will coma back to factory reset.